Easy to Use: large, rugged touch screen display shows all your important information. Simple, intuitive software guides you through set up and initial programming. Modular Components: make trouble shooting and maintenance fast while leaving ample workroom. 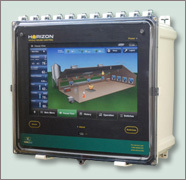 Multiple Programs & Multiple Zones: to control virtually any barn configuration. Remote Access: through any web-enabled computer. Dual Alarm Relays: allows you to specify major and minor alarms and choice of local and remote notifications. Smooth Minimum Vent Curve: reduces disruptions to delicate chicks and poults; options to automatically adjust minimum ventilation based on humidity and outside temperature. Optional Wear Levelling: helps balance motor wear across tunnel fans. 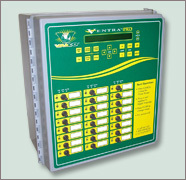 One Touch Access to Pertinent Information: daily high/low temperatures, water usage, feeder run times, etc. All available in one simple menu at the touch of a button. Plug In Relays: make it easier to swap parts in the field with minimal downtime. Built In Assistant: shows data points that fall outside of acceptable parameters for quick and easy diagnosis of problems. Multiple Programs: stored in one SD card for quick changing of seasonal ventilation parameters. Heater/Curtain Zone Interlock: reduce wasted fuel by preventing heaters from turning on if the curtains in the same zone are open by more than 1″. Heat Purge: heated air holds more moisture, so less air needs to be exhausted to remove moisture. Also, a gentler temperature swing is easier on the animals for improved health. Curtain Exercise Routine: when hot weather causes curtains to stay open day after day, rodents can begin to build nests inside the curtain folds. The new exercise routine can fully close and open the curtains automatically, which will dump out the nests and prevent damage to your curtains. Outside Temp. Influence/High Temp Alarm: reduce nuisance alarms during warm weather; high temperature alarm will be adjusted based on high outside temperatures.